After testing, Chrysler conducted a user program from October 1963 to January 1966 that involved 203 individual drivers in 133 different cities across the United States cumulatively driving more than one million miles (1.6 million km). The program helped the company determine a variety of problems with the cars, notably with their complicated starting procedure, relatively unimpressive acceleration, and sub-par fuel economy and noise level. The experience also revealed key advantages of the turbine engines, including their remarkable durability, smooth operation, and relatively modest maintenance requirements. Chrysler began researching turbine engines for aviation applications during the late 1930s, led primarily by executive engineer George Huebner. After World War II, Huebner was part of a group of engineers who began exploring the idea of powering a car with a turbine. Other members of the secretive Chrysler research team which worked on automotive turbines included fellow engineers Bud Mann and Sam B. Williams. The concept intrigued them, largely because turbine engines have fewer moving parts than their piston-powered counterparts and can run on a variety of fuels. According to historian Charles K. Hyde, by the mid-1950s Chrysler "led the way in terms of gas turbine research" (although General Motors and Rover also built operational turbine cars after World War II). 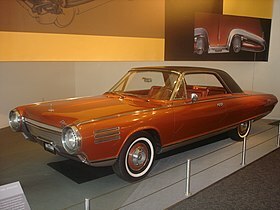 The Chrysler Turbine Car is powered by the A-831, Chrysler's fourth-generation turbine engine. The most notable difference from its predecessor, the CR2A, was its use of twin regenerators (one mounted on either side of the gasifier) instead of a single top cover-mounted heat exchanger. This design helped the A-831 trim 40 pounds (18 kg) from the CR2A's weight, reducing it to a relatively-light 410 lb (186 kg). Huebner described the turbine as similar to a jet engine, noting that it had only one spark plug and about 80 percent fewer parts than a typical automotive piston engine. Due to their construction, the engines did not require antifreeze, a cooling system, a radiator, connecting rods, or crankshafts. The engine produced 130 bhp (97 kW) at 36,000 revolutions per minute (rpm), 425 lb⋅ft (576 N⋅m) of torque, and idled between 18,000 and 22,000 rpm. At idle, its exhaust did not exceed 180 °F (82 °C). When driven at 120 mph (193 km/h), the turbine ran at its maximum of 60,000 rpm. The A-831's compressor had a pressure ratio of 4:1 and an efficiency of 80 percent; its combustor operated at 95 percent efficiency. The car's bodies were handmade by Italian design studio Ghia, which had built a number of concept cars for Chrysler (including an Imperial limousine and the Norseman). The mostly completed Turbine Car bodies, which were assembled, painted, trimmed, and upholstered by Ghia in Italy, were shipped to Chrysler's Greenfield Road turbine facility in Detroit for final assembly; this consisted of installing the turbine engines, TorqueFlite transmissions, electrical wiring, and components such as radios and heaters. Building an individual car may have cost as much as between $50,000 to $55,000 (equivalent to $404,000 in 2018 to equivalent to $444,000 in 2018); Virgil Exner, Jr., estimates that the bodies themselves cost about $20,000 (equivalent to $162,000 in 2018), although Chrysler never revealed the cost of each turbine engine. A total of 50 identical Turbine Cars were built between October 1963 and October 1964. They were all two-door hardtop coupes, with air-over-oil power brakes and power steering. The cars had independent front suspension with a coil spring at each front wheel, eschewing Chrysler's contemporary-standard independent front longitudinal torsion bar system (although their rear suspension utilized off-the-shelf leaf springs). All four wheels were equipped with power-assisted drum brakes. Two of the cars gave rides to visitors at the 1964 New York World's Fair, and another went on a worldwide tour; 50 were lent to the general public as part of a user program. The cars were given to drivers for a three-month period at no charge, aside from fuel costs; participants also gave Chrysler in-depth interviews within two weeks of returning their cars. During the user program, which ran from October 1963 to January 1966, the cars' operational downtime was reduced from four percent early on to one percent by its conclusion. In April 1966, product planning and development vice president Harry E. Chesebrough noted that the 50 test cars would be taken off the road regardless of whether the Chrysler Turbine Car went into production. Chrysler destroyed 46 of the cars after it finished the user program and other public displays. Forty-five of the cars were burned and crushed at a scrapyard south of Detroit, and the other was destroyed at Chrysler's Chelsea Proving Grounds. A widely circulated explanation was that the cars were destroyed to avoid a substantial tariff on the imported Ghia bodies, although author Steve Lehto claims that this has been "largely discredited". The destruction of the cars was in line with the automobile industry's practice of not selling non-production or prototype cars to the public. According to Lehto, the decision was influenced by Chrysler's public relations concerns: the potential difficulty of keeping the cars running and fears that owners would replace the turbine powerplants with piston engines. A Chrysler executive was quoted in Look: "Our main objective is research, and we did not want turbines turning up on used-car lots." A similar practice was later used by General Motors with its EV1 when it terminated the program and destroyed most of the cars in 2003. #991245: Smithsonian Institution, Washington, D.C.
^ a b Adler, Dennis; Shelby, Carroll (2008). 50 Cars to Drive. Globe Pequot Press. p. 74. ISBN 978-1-59921-230-2. Archived from the original on February 6, 2018 – via Google Books. ^ a b c Lehto 2010, p. 43. ^ a b c d e Hyde 2003, p. 204. ^ a b c d e f g h i Norbye 1975, p. 293. ^ a b c d Norbye 1975, p. 283. ^ Lehto 2010, pp. 2–3. ^ Lehto 2010, pp. 4–7. ^ a b c d e Lehto, Steve (April 17, 2017). "That Time the President of Mexico Rode in a Turbine Chrysler Fueled by Tequila". Road & Track. Archived from the original on June 22, 2017. Retrieved June 21, 2017. ^ a b c d Hyde 2003, p. 203. ^ a b c Truett, Richard (May 17, 2016). "Chrysler Turbine car shows the future is always changing". Automotive News. Retrieved June 21, 2017. ^ Lehto 2010, pp. 8–9. ^ Lehto 2010, p. 10. ^ Lehto 2010, p. 12. ^ a b c Norbye 1975, p. 275. ^ Lehto 2010, pp. 15–17. ^ Donovan, Leo (March 27, 1956). "Turbine Car Heads West". Detroit Free Press. Archived from the original on August 30, 2017. Retrieved August 29, 2017 – via Newspapers.com . ^ Donovan, Leo (February 13, 1957). "Turbine Test Stepped Up". Detroit Free Press. Archived from the original on August 30, 2017. Retrieved August 29, 2017 – via Newspapers.com . ^ Lehto 2010, p. 18. ^ Lehto 2010, pp. 18–19. ^ Lehto 2010, p. 20. ^ a b Norbye 1975, p. 278. ^ Lehto 2010, pp. 21–22. ^ a b Lehto 2010, pp. 22–23. ^ Norbye 1975, p. 280. ^ Olmsted, Fred (May 11, 1960). "Third Chrysler Turbine Due for Auto Test Soon". Detroit Free Press. Archived from the original on August 30, 2017. Retrieved August 29, 2017 – via Newspapers.com . ^ Norbye 1975, p. 281. ^ a b Lehto 2010, pp. 23–25. ^ Norbye 1975, pp. 282–283. ^ a b Olmsted, Fred (February 2, 1962). "Public Sees Turbine Cars". Detroit Free Press. Archived from the original on August 30, 2017. Retrieved August 29, 2017 – via Newspapers.com . ^ Lehto 2010, pp. 27–29. ^ a b c "Turbine Cars Due in 1963". Detroit Free Press. December 28, 1961. Archived from the original on August 30, 2017. Retrieved August 29, 2017 – via Newspapers.com . ^ Lehto 2010, p. 30. ^ a b Norbye 1975, p. 284. ^ a b c Lehto 2010, p. 31. ^ a b c "Tucson gets a Preview of Chrysler's Turbine Car". Tucson Daily Citizen. March 18, 1965. Archived from the original on August 2, 2017. Retrieved July 23, 2017 – via Newspapers.com . ^ a b c d Friedlander, Paul J. C. (April 29, 1973). "Gas Turbines: Present and Future". The New York Times. Archived from the original on August 30, 2017. Retrieved August 29, 2017. ^ Lehto 2010, p. 36. ^ Turner, Lianne (November 16, 2010). "Jay Leno shows off car that 'runs on tequila and perfume'". CNN. Archived from the original on August 2, 2017. Retrieved June 21, 2017. ^ a b c d Lehto 2010, p. 46. ^ Lehto 2010, p. 84. ^ Norbye 1975, p. 289. ^ Norbye 1975, p. 290. ^ Norbye 1975, p. 286. ^ Norbye 1975, p. 292. ^ a b Florea, Ciprian (February 18, 2014). "1963 Chrysler Turbine Car Sounds Like a Jet Plane". autoevolution. Archived from the original on August 2, 2017. Retrieved June 21, 2017. ^ Lehto 2010, p. 32. ^ a b Lehto 2010, p. 45. ^ Lehto 2010, pp. 22, 40. ^ Lehto 2010, pp. 22, 40–41. ^ Lehto 2010, p. 41. ^ a b c Hayes, Paul R. (May 20, 1963). "Auto Facts: 200 Motorists to Give Chrysler Turbine 'Ride-and-Drive' Test for Year". The Philadelphia Inquirer. Archived from the original on September 1, 2017. Retrieved August 31, 2017 – via Newspapers.com . ^ Lehto 2010, pp. 42, 111. ^ Lehto 2010, pp. 44–45, 124. ^ Lehto 2010, pp. 44–45. ^ Lehto 2010, p. 42. ^ Lehto 2010, pp. 43–44. ^ a b "Piston Auto Engines Are Challenged: Chrysler Unveils Turbine Power Plant". The News-Palladium. Benton Harbor, Michigan. May 16, 1963. Archived from the original on September 1, 2017. Retrieved August 31, 2017 – via Newspapers.com . ^ Lehto 2010, pp. 46–48. ^ Lehto 2010, p. 123. ^ Lehto 2010, p. 124. ^ Lehto 2010, p. 47. ^ a b c Hyde 2003, p. 205. ^ a b c d e f g h i j Lassa, Todd (July 21, 2006). "Road Test: 1964 Chrysler Turbine Car". Motor Trend. Archived from the original on September 5, 2017. Retrieved September 4, 2017. ^ Lehto 2010, p. 112. ^ Lehto 2010, p. 115. ^ Lehto 2010, p. 113. ^ Lehto 2010, p. 57. ^ Lehto 2010, pp. 88, 92, 117. ^ Lehto 2010, p. 70. ^ a b c Simpson, Roger A. (April 13, 1966). "2-Year Test Ended: Gas Turbine Car is Great, But..." Detroit Free Press. Archived from the original on August 30, 2017. Retrieved August 29, 2017 – via Newspapers.com . ^ Lehto 2010, p. 118. ^ Lehto 2010, pp. 46, 90–91. ^ Norbye 1975, pp. 293–294. ^ Lehto 2010, pp. 77, 116. ^ Lehto 2010, p. 77. ^ Norbye 1975, p. 294. ^ Olmsted, Fred (April 15, 1966). "Chrysler Corp. will chop". Detroit Free Press. Archived from the original on August 30, 2017. Retrieved August 29, 2017 – via Newspapers.com . ^ Lehto 2010, p. 122. ^ a b c Lehto 2010, p. 121. ^ Lehto 2010, p. 169. ^ a b Hyde 2003, p. 206. ^ Norbye, Jan P.; Dunne, Jim (September 1973). "For the Gas Turbine Car, It's Now or Never". Popular Science. pp. 56–59. Archived from the original on February 6, 2018 – via Google Books. ^ Francis, Devon (September 1968). "Is There a Steam Car in Your Future?". Popular Science. pp. 64–67, 210–211. Archived from the original on February 6, 2018 – via Google Books. ^ Norbye, Jan P. (March 1971). "Tiny 80-hp Gas Turbine to Power Compact Car". Popular Science. p. 34. Archived from the original on February 6, 2018 – via Google Books. ^ Thomas, Phillip. "Futuristic engines promised low maintenance, excellent power, and increased reliability at the height of the American Jet Age". Motor Trend. ISSN 0027-2094. ^ Lehto 2010, p. 93. ^ a b c Lehto 2010, p. 170. ^ a b Lehto 2010, pp. 170–171. ^ a b c d Lehto 2010, p. 171. ^ Lehto 2010, p. 172. ^ Butcher, David. "James May's Cars of the People: Series 2 – Episode 3". Radio Times. Archived from the original on December 16, 2017. Retrieved December 15, 2017. ^ Lehto 2010, pp. 172, 174–175. ^ "Automotive Showplace". Detroit Historical Society. Retrieved May 11, 2018. Hyde, Charles K. (2003). Riding the Roller Coaster: A History of the Chrysler Corporation. Wayne State University Press. ISBN 0-8143-3091-6. Lehto, Steve (2010). Chrysler's Turbine Car: The Rise and Fall of Detroit's Coolest Creation. Chicago Review Press. ISBN 978-1-56976-771-9. Norbye, Jan P. (1975). The Gas Turbine Engine: Design, Development, Applications. Chilton Book Company. ISBN 0-8019-5753-2. Wikimedia Commons has media related to Chrysler Turbine Car.